I wanted to let you know about two fantastic clinics coming up this weekend in British Columbia, both in the gorgeous setting of the renowned Nicola Valley. 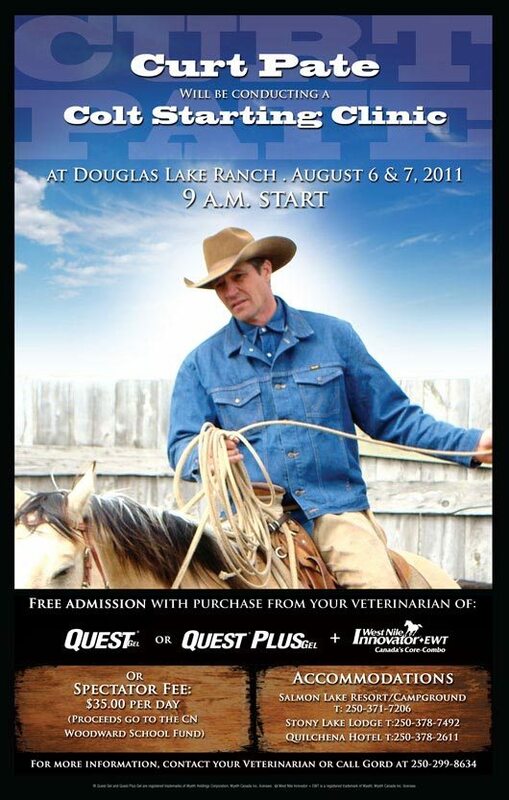 Curt and Tammy Pate will be leading two clinics at Stump Lake Ranch and Douglas Lake Ranch, B.C. on August 6 and 7. For Curt Pate it’s a return trip to Douglas Lake Ranch. He will be conducting a Colt Starting Clinic on August 6 and 7 (with a 9 a.m. daily start). 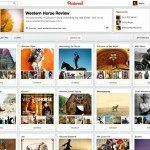 Last year, 20 colts from Douglas Lake Ranch and other historical B.C. 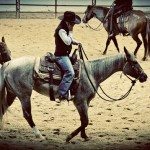 ranches were started under the professional guidance of this AQHA clinician. A Montana native, Curt Pate has been conducting demonstrations and clinics on stockmanship, colt starting, horsemanship and safety for over a decade now. This, along with his experience in managing his own ranch and his effective communication skills, make him one of the most sought after clinicians on both the national and international scenes. 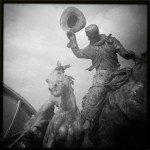 He was chosen by the AQHA to serve as a Professional Horseman and their Regional Experience Clinician, both highly prized endorsements. Enjoy the scenery at one of the most beautiful ranches and country in the world for two very special days that could change the way you ride or handle your horse, or just for the great experience this clinic offers. Tickets can be purchased at the Ranch at the cost of $35.00 per day, with proceeds going to the CN Woodward School. You can also get a free two-day pass when you purchase Quest or Quest Plus along with a West Nile Innovator Combo from your veterinarian. For more information, please contact Gord at 250-299-8634. 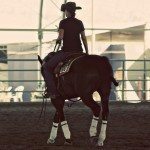 Simultaneously, with a 10 a.m. start, the Stump Lake Ranch will hold Tammy Pate’s Unique Yoga and Horsemanship Clinic. Tammy is among the great Quarterfest clinicians. She is proud to be known as a cowboy’s wife. Born into a ranching family, Tammy grew up with a steer-wresting father and sisters that “rode from the time we could barely walk”. Her grandmother instilled in her the values of ranching life, a deep respect for nature and the practical skills needed to succeed. 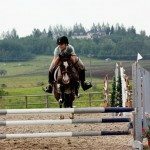 Tammy married Curt and together they deepened their horsemanship and developed innovative and gentle ways of training horses, keeping the stress levels low on horses, cattle and people. Over the years, Tammy discovered yoga and its parallels to horsemanship. 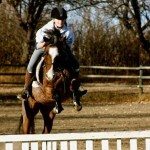 She describes it as staying in balance in movement and centered physically and mentally for both horse and rider. 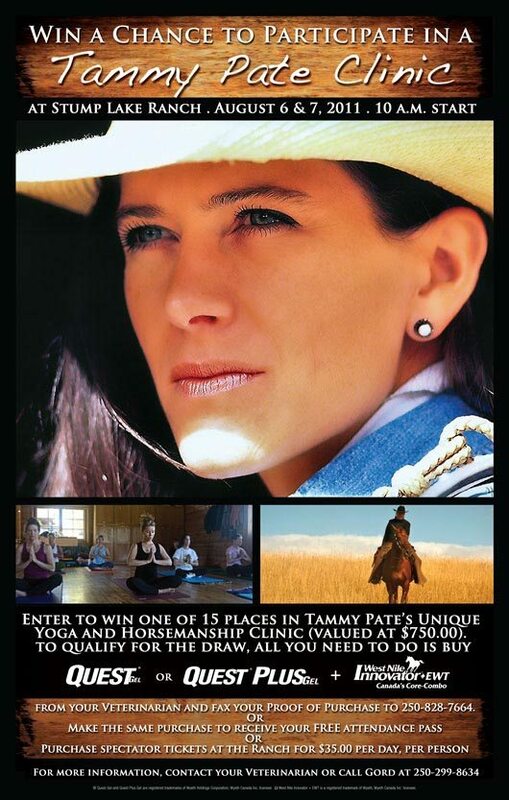 You can have a chance to win a participation in Tammy’s Unique Yoga and Horsemanship Clinic. All you need to do is buy Quest or Quest Plus with a West Nile Innovator Combo from your Veterinarian and fax your Proof of Purchase to 250-828-7664. You can also make the same purchase to receive your FREE attendance pass or purchase spectator tickets at the Ranch for $35.00 per day, per person. For more information, please contact your Veterinarian or call Gord at 250-299-8634.